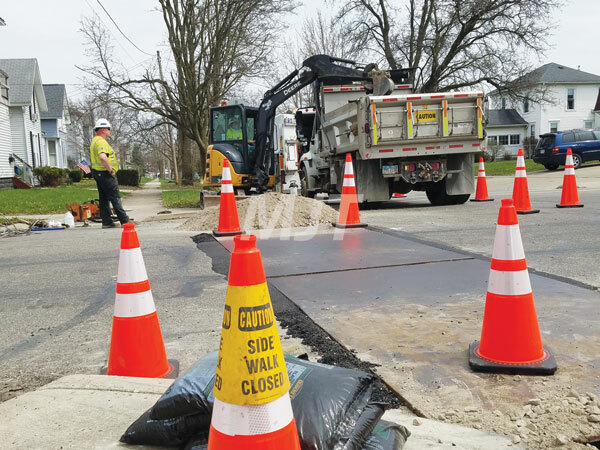 Grove Street in Marysville was closed for a portion of the day Thursday as crews from Columbia Gas worked to repair a series of natural gas leaks. Pictured above, workers dig through asphalt and dirt to get to a leaking line at the intersection of Grave and Ninth streets. The smell of gas filled the air in Marysville Thursday. Grove Street, between Eighth Street and Collins Avenue was closed for a portion of the day Thursday after a contractor broke a gas line in the area. “There must have been an unmarked line there and the contractor struck it,” Andrako said. About 10:06 a.m., the Marysville Division of Fire received the first call of a gas leak. Chief Jay Riley said the incident created several breaks. He said two homes were evacuated, “because the wind was blowing the natural gas in the direction of the homes.” Additionally, safety personnel closed the city’s Lewis Park in the area. Gas could be smelled for several blocks surrounding the leaks. The fire department cleared the scene at 3:15 p.m., but Columbia Gas repairmen remained on scene for several hours. By that point, one lane of traffic was opened. Columbia Gas was unable to be reached for comment. According to the Columbia Gas website, anyone smelling natural gas in the area should leave the area, then call 911 and the gas company at 1-800-344-4077.